Sorry I haven't posted in a while. I was out of town for several weeks taking some time off, and have been super busy since then. Not that I haven't been thinking about budo, 'cause I have—I just need to find more hours in the day to write them all down! Where is your "other" hand? 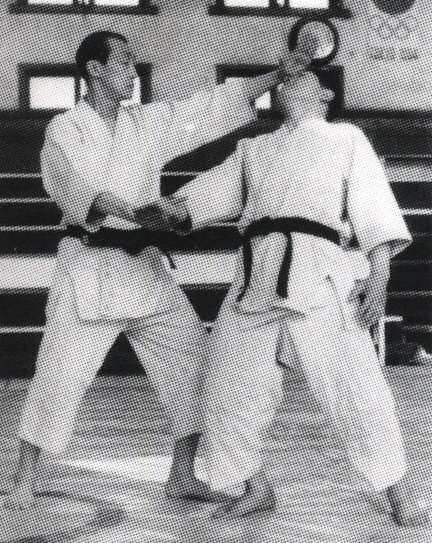 While many, if not all, of the techniques in aikido involve both hands, there's usually one dominant hand, one hand that's doing the main thing, executing the throw or performing the lock. Spend some time thinking about the other hand and what it's doing, what it's job is. Sometimes it's helping or supplementing the first hand. Sometimes it's just in uke's face to keep him off you. Sometimes it simply lies in wait. But always ready, alert, involved; never limp, casual, neglected. Think about it with these in particular (I'm referring to the versions as they appear in junana hon kata): aigamae ate, gyakugamae ate (as in the image above), ude hineri, hiki taoshi, kote gaeshi, and tenkai kote hineri.